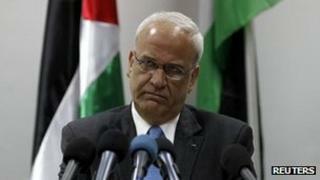 Israeli and Palestinian officials have met for the first time in over a year. Israeli envoy Yitzhak Molcho and Palestinian negotiator Saeb Erekat held talks in the Jordanian capital Amman alongside international mediators. Officials from both sides had played down the prospect of any imminent resumption in peace talks, and the meeting ended with no breakthrough. Negotiations stalled in late 2010 in a dispute over Jewish settlement building in the West Bank. Both Israeli and Palestinian officials did nothing to raise expectations ahead of the meeting, reports the BBC's Kevin Connolly in Jerusalem, and there was never a point in the evening where it felt that they would be exceeded. The priority for both sides will be to avoid blame if the process cannot be restarted, he adds. Jordanian Foreign Minister Nasser Judeh described the talks as "positive". "The important thing is the two sides have met face-to-face today," he said. "We agreed that the discussions will be continuous, that the meetings will continue and will take place here in Jordan. "And we also agreed that we should not publicise about these meetings ahead of time, except through the Jordanian host, and I tell you that you may hear about it or you may not hear about it." Mr Judeh said that the Israelis had promised to study a Palestinian paper on borders and security. The Israelis and Palestinians are meeting bilaterally as well as with the Quartet of Middle East mediators - the United States, the European Union, Russia and the United Nations. The Quartet had said talks between the two sides had to resume before the end of January. Our correspondent says neither side wants to be held responsible for a breakdown in the talks, but in times of mounting uncertainty around the Middle East neither feels the time is right for serious negotiations. Meanwhile representatives of Palestinian Islamist group Hamas, which runs the Gaza Strip, have condemned the meeting. "This meeting will continue the policy of failure... We in the Hamas movement demand that the Palestinian Authority stop and boycott all these kinds of meeting which are politically dangerous," Hamas spokesman Sami Abu Zuhri told Reuters.